This article is about the 1987 song "Sweetest Thing" by Irish rock band U2. For other songs with similar titles, see Sweetest Thing (disambiguation). "Sweetest Thing" is a song by Irish rock band U2. It was originally released as a B-side on the "Where the Streets Have No Name" single in 1987. The song was later re-recorded and re-released, as a single in October 1998 for the band's compilation album, The Best of 1980-1990. 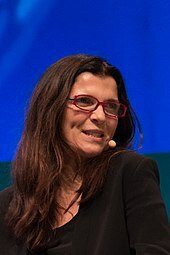 The song was reportedly written by Bono as an apology to his wife Ali Hewson for having to work in the studio on her birthday during The Joshua Tree sessions. At Alison's request, profits from the single went to her favoured charity, Chernobyl Children's Project International. A version by New York gospel choir, The New Voices of Freedom, appears on the soundtrack to the 1988 Bill Murray film Scrooged. It was recorded following U2's performance of "I Still Haven't Found What I'm Looking For" with the choir at Madison Square Garden, which appears on the band's 1988 album Rattle and Hum. To promote the release of the single in 1998, Island Records distributed "Sweetest Thing" chocolate bars, wrapped to look like the single, throughout Europe. They have become a very valuable collectors item among U2 fans during the 2000s. The song reached number one in both Canada and Ireland, number three in the UK, number six in Australia, number 63 on the Billboard Hot 100, number nine on the US Modern Rock Tracks chart and number 31 on the US Mainstream Rock Tracks chart. The song made its live debut on the opening night of the Elevation Tour, and was played occasionally over the first and second legs. It was then not played again until the Innocence + Experience Tour, where once again it only made occasional appearances over the course of the tour. Performances on the Elevation Tour featured Bono playing the piano parts while the Edge played electric guitar. On the Innocence + Experience Tour, it was played on the e-stage in a stripped down version, with the Edge playing acoustic guitar and Bono joining in on the piano about halfway through the song. The video, directed by Kevin Godley, features Bono taking his wife Ali Hewson on a carriage ride along Fitzwilliam Place, and on to Upper Fitzwilliam Street in Dublin, enlisting various performers along the way in an effort to apologise to her. The performers featured include Riverdance, Boyzone, Steve Collins, the Artane Boys Band, and the Celtic Knights. The Edge, Adam Clayton, Larry Mullen, Jr., Norman Hewson (Bono's brother), Dik Evans (The Edge's brother), and Ali herself appear in the video as well. The back cover listed the third track simply as a live version of "An Cat Dubh". ^ Sams, Aaron; Kantas, Harry. 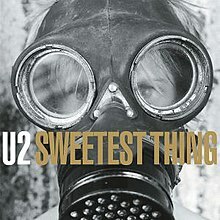 "U2 – "Sweetest Thing" Single". U2songs.com. Retrieved 2 August 2016. ^ a b Sams, Aaron; Kantas, Harry. "U2 – "The Sweetest Thing" (Single Mix) Video". U2songs.com. Retrieved 2 Aug 2016. ^ McGee, Matt (2008). U2:A Diary. Omnibus Press. p. 111. ISBN 978-1-84772-108-2. ^ "Sweetest Thing Chocolate Bar". U2 Collectibles and Memorabilia - Silver & Gold. U2Wanderer.org. Retrieved 2007-03-23. ^ "U2 Sweetest Thing - U2 on tour". U2gigs.com. Retrieved 2015-12-25. ^ Sams, Aaron; Kantas, Harry. "U2 – "The Sweetest Thing" (Single Mix) Video". U2songs.com. Retrieved 2 Aug 2016. ^ "Australian-charts.com – U2 – Sweetest Thing". ARIA Top 50 Singles. ^ "Austriancharts.at – U2 – Sweetest Thing" (in German). Ö3 Austria Top 40. ^ "Ultratop.be – U2 – Sweetest Thing" (in Dutch). Ultratop 50. ^ "Ultratop.be – U2 – Sweetest Thing" (in French). Ultratop 50. ^ "Top RPM Singles: Issue 7041." RPM. Library and Archives Canada. Retrieved 28 March 2018. ^ "The Best of 1980-1990 Awards". AllMusic. Archived from the original on 2016-05-22. Retrieved 2017-12-30. ^ "U2: Sweetest Thing" (in Finnish). Musiikkituottajat – IFPI Finland. ^ "Lescharts.com – U2 – Sweetest Thing" (in French). Les classement single. ^ "Offiziellecharts.de – U2 – Sweetest Thing". GfK Entertainment Charts. ^ "The Irish Charts – Search Results – Sweetest Thing". Irish Singles Chart. Retrieved 28 March 2018. ^ "Indice per Titolo: S" (in Italian). Hit Parade Italia. Retrieved 4 January 2013. ^ "Nederlandse Top 40 – U2" (in Dutch). Dutch Top 40. ^ "Charts.nz – U2 – Sweetest Thing". Top 40 Singles. ^ "Norwegiancharts.com – U2 – Sweetest Thing". VG-lista. ^ "Official Scottish Singles Sales Chart Top 100". Official Charts Company. Retrieved 28 March 2018. ^ "Swedishcharts.com – U2 – Sweetest Thing". Singles Top 100. ^ "Swisscharts.com – U2 – Sweetest Thing". Swiss Singles Chart. ^ "Official Singles Chart Top 100". Official Charts Company. Retrieved 28 March 2018. ^ "U2 Chart History (Hot 100)". Billboard. Retrieved 28 March 2018. ^ "U2 Chart History (Adult Pop Songs)". Billboard. Retrieved 28 March 2018. ^ "U2 Chart History (Alternative Songs)". Billboard. Retrieved 28 March 2018. ^ "U2 Chart History (Mainstream Rock)". Billboard. Retrieved 28 March 2018. ^ "RPM's Top 100 Hit Tracks of '98" (PDF). RPM. Vol. 63 no. 12. 14 December 1998. p. 20. Retrieved 23 March 2019. ^ "Top Singles - Volume 70, No. 8, December 13, 1999". RPM. December 13, 1999. Archived from the original on March 10, 2016. Retrieved November 21, 2017. "Two Hearts Beat as One"
"Where the Streets Have No Name"
"When Love Comes to Town"
"Even Better Than the Real Thing"
"Who's Gonna Ride Your Wild Horses"
"Hold Me, Thrill Me, Kiss Me, Kill Me"
"If God Will Send His Angels"
"Sometimes You Can't Make It on Your Own"
"I'll Go Crazy If I Don't Go Crazy Tonight"
"The Miracle (of Joey Ramone)"
"You're the Best Thing About Me"
"Love Is Bigger Than Anything in Its Way"
Songs written by Larry Mullen Jr. This page was last edited on 23 March 2019, at 21:12 (UTC).